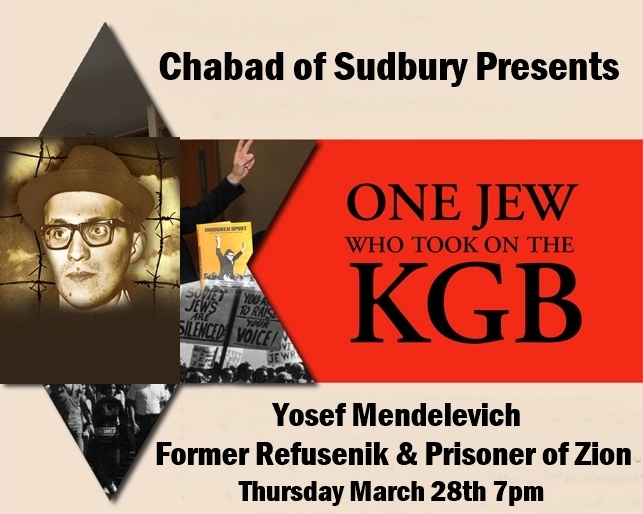 Chabad of Sudbury invites you for an evening with Yosef Mendelevich a Former Prisoner of Zion and Refusenik. Yosef has a dramatic story of survival, near hijacking, risk taking and perserverance as he worked with friends to highlight the plight of Russian Jewry during those difficult years. His story is riveting and inspiring and will keep you spellbound and entertained as you hear firsthand from this Jewish Hero. To RSVP Please click the link below. Fee: $10 for Paid RSVP's before March 25th, $15 after that or at the door. If you would like to be a sponsor of this event you may do so for $360 as a Diamond Sponsor or $180 as a Silver Sponsor. Sponsors are invited for a Pre Lecture Cocktail Event with the Guest Speaker. Yosef began to develop his Jewish identity as a young man living under Soviet oppression in Riga. He helped organize a Jewish underground and then, with a group desperate to emigrate to Israel but denied exit visas, planned to take a Russian plane to fly it to freedom. Before the group could board the plane, the KGB arrested them all, resulting in the infamous Leningrad Trial which riveted international attention. The defendants exhibited great bravery in court, and the international uproar moderated two of the death sentences. Yosef has incredible stories of how he survived 11 years of the Gulag, resisting all attempts to squash his body and soul, and deepening his faith, commitment and love for Israel and the Jewish people. Worldwide pressure by the Soviet Jewry movement — especially by students — finally gained his release to Israel.